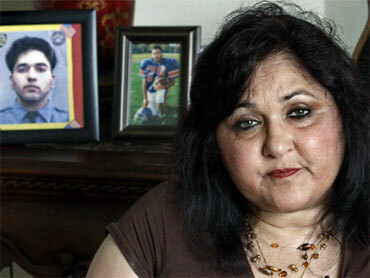 Talat Hamdani traveled to Mecca to pray that her missing son, a medic, was safe in the days after Sept. 11. She held out hope that his Muslim background had led to his detention as a suspect, considering it better than the alternative. When part of his body was returned to her - his lower half shattered into 34 pieces - it was final proof he had indeed been killed when Islamic extremists brought down the World Trade Center. As Americans take sides over plans to build an Islamic cultural center and mosque blocks away, Hamdani says it feels personal. "Why are we paying the price? Why are we being ostracized? Our loved ones died," she said at her Lake Grove, N.Y., home. "America was founded on the grounds of religious freedom," and opposition to the cultural center "is un-American. It's unethical. And it is wrong." The thousands of relatives of the 2,976 victims have no single representative and no unified voice, even as another 9/11 anniversary approaches. The conflict is dividing a group that in many ways has never been united, with some saying the cultural center would reopen old wounds too close to hallowed ground and others say that opposing it is tantamount to bigotry. "It is unfair to persecute the group, however, in turn, there should be some respect for the feelings of the people that are forever attached to this site due to their losses," the New City, N.Y., resident, whose father, Yudh, died in the north tower, wrote in an e-mail. "I think people have a right to be upset about it, just as much as people have a right to build a mosque." Jim Riches, a former New York Fire Department deputy chief whose son, Jimmy, was killed at the trade center, believes the dispute has nothing to do with religious freedom. "We're not telling them not to practice their religion. ... It's about location, location, location," he said, asking why the mosque couldn't be built farther away from the land that he still considers a cemetery. "It's disrespectful. You wouldn't put a Japanese cultural center at Pearl Harbor." Liza Murphy feels differently. Her brother, Charlie, died at ground zero, but she says she doesn't lay claim to the sprawling, 16-acre site. "It's a place where a terrible tragedy took place, but I don't see what makes it sacred," said the Brooklyn resident. "Nine years later, that now belongs to the public. And my brother and his death are private and belong to me." Murphy says she has no objection to the planned mosque and wouldn't want to judge one group of Muslims based on the actions of another. But Peter Gadiel says he owes no apologies for singling one group out. Since his son, James, was killed at the trade center, Gadiel has argued publicly that all Muslims should share some collective guilt for what happened on Sept. 11, 2001. "The fact is that Islam does not coexist well with other religions, and you can't separate that from Islam," the Kent, Conn., resident said, explaining his stand against the mosque. "If that sounds intolerant on my part, that's too bad." The families' impassioned responses to the prospect of the mosque have influenced the public debate. Gov. David Paterson has suggested moving the project further away from the trade center site out of respect for opponents' feelings, while Mayor Michael Bloomberg came out in support of the mosque, calling it a test of the separation of church and state. President Barack Obama has said he believes Muslims have the right to build the Islamic center as a matter of religious freedom, though he's also said he won't take a position on whether they should actually build it. The imam leading plans for the center on Friday called extremism a security threat in both the West and the Muslim world. Feisal Abdul Rauf made his comments to Associated Press Television News in Bahrain during a Mideast tour funded by the U.S. State Department, but he wouldn't discuss the uproar over the Islamic center. Relatives of those slain on Sept. 11 have made their diverging voices heard on a number of issues over the years - from whether to try the suspects in a civilian court to the location of a proposed freedom museum at ground zero that is no longer planned for the site. "This is anniversary season. It's really, really hard," the Manhattanite said. "Passions are up and this is bringing up a lot of hurt in people." "The powers of evil were piloting those airplanes," he said of the Sept. 11 attackers. Now, with the mosque dispute, "here is where we're falling into the terrorists' trap ... trying to tear each other apart. Good people fighting other good people - does that sound like evil at work?"